Raymond C. Dobbratz, 80, of Watertown passed away Thursday, Sept. 24, 2009, at home. Ray was born on Dec. 24, 1928, the son of Gerhard and Lily (Loeffler) Dobbratz. Ray married Marie Schwefel on Sept. 6, 1952, in Watertown. Ray attended one year at Northwestern College in Watertown before beginning his apprenticeship with Hafemeister Funeral Home in 1947. Ray later attended the Wisconsin Institute of Mortuary Science in Milwaukee from 1949-50 and became a licensed funeral director and embalmer in July of 1950. Ray and his wife Marie owned and operated Hafemeister Funeral Home from 1974 to 1999. Dobbratz had been affiliated with Hafemeister Funeral Home from 1947 until he sold the business in 1999 to the Koepsell family which operated funeral homes in Beaver Dam and Mayville. The business was later sold to longtime employee Richard Nienow. Dobbratz completed mortuary school and became a licensed funeral director and embalmer in 1950. When Henry Hafemeister died in 1966, Dobbratz and the late Roland Harder became partners. Harder died in 1974 and Dobbratz and his wife, Marie, became sole owners of the business until it was sold a decade ago. Ray served in the Wisconsin National Guard for eight years and was a member of Watertown American Legion Post 189 and an honorary member of Watertown AMVETS Post 35. He and his wife Marie annually sponsored a unit in the Fourth of July parade to promote patriotism and was honored in 1985 by having the Main Street Bridge named after him for a year. He was a past ambassador of Watertown Area Chamber of Commerce, and was a former member and president of Watertown Toastmasters Club, Wethonkitha Club and Watertown Humane Society. Ray was a member of St. Mark's Lutheran Church. He was a former member of the Central Business Association, South Central Funeral Directors Association, Wisconsin Funeral Directors Association and the National Funeral Directors Association. Survivors include his wife Marie Dobbratz of Watertown; brother, Fred (Ruth Schwefel) Dobbratz of Madison; sister, Marie Kleisteiber of Chelsea, Mich; two sister-in-laws, Ginny Dobbratz and Janet Dobbratz both of Watertown; three brother-in-laws, Ruben (Marji) Schwefel of Dousman, Wilmar (Daisy) Schwefel of Deforest and John Schwefel of Watertown; sister-in-law, Ora (Lou) Kuckkan of Watertown; also survived by a number of nieces, nephews, other relatives and friends. He was preceded in death by his parents, brothers, Herman and Edward, brother-in-law, Roy Schwefel and sister-in-law, Myrtle Hrobsky. Ray was born on Dec. 24, 1928, the son of Gerhard and Lily (Loeffler) Dobbratz. Memorials to St. Mark's Lutheran Church or School or the charity of one's choice would be appreciated. Funeral service will be held on 11 a.m. Monday at St. Mark's Lutheran Church Watertown with the Rev. James Werner, the Rev. Karl Walther and the Rev. Michael Jensen officiating. 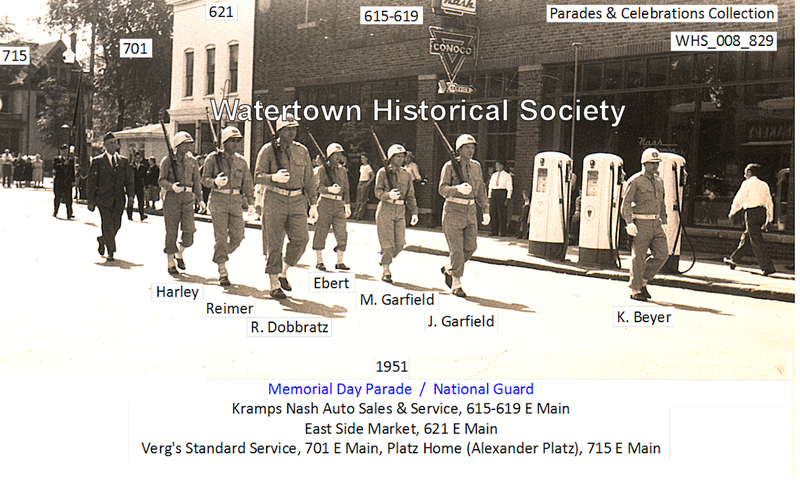 Burial will be in the Lutheran Cemetery with military rites provided by the Watertown American Legion Post 189.